Millions of people are afraid of taking decisions. They agonize for years about things they know they should be doing, but cannot find the time to do. They wish they could gather the courage, the resources, and determination to get rid of old habits, and go into a new direction. They wish they could explore new avenues, but they seem unable to deviate from their routines. Indecision and fear of the unknown are universal phenomena. To a larger or lesser extent, everybody is afraid of changing his habits, disrupting his life, and losing what he has. Yet, we all realize that we cannot grow without taking risks, making ourselves uncomfortable, and committing occasional errors. I have found a solution to push myself over the line, and take those initial, risky steps that can lead to better things. This is a technique I learned from watching animals in nature. Look how young animals decide whether unknown food is good to eat, whether they can explore some new territory, or climb a higher tree. They don't spend months agonizing about the possible negative consequences, the possible failure and ensuing ridicule. What they do is simply to take a small step, try out the new experience, and see what happens. They take a small bite of the new food, and look around nervously at the new territory. They quickly check out if the new thing is going to work or not. If the adventure proves promising, they go ahead. If it doesn't, they simply take a step back, and return to their old routine. In my experience, this method can allow you to make 75% of your decisions quickly, and mostly get them right. You don't need to take huge, decisive steps, and put your livelihood on the line. You don't need to risk losing your family, your health, and your reputation. Leave those spectacular life-or-death decisions for movies, novels, and poetry. High-risk adventures belong to fiction, and that's where they should remain. Human beings usually do better in life if they behave prudently and rationally. More often than not, you will do better if you take a low-risk approach, and increase your bet as you go along. And if the project doesn't work as you expected, you don't need to turn the bad experience into a big deal. Simply cut your losses, and move on. 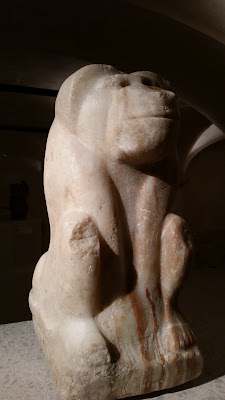 Image: photograph of ancient Egyptian sculpture; photograph taken by John Vespasian, 2017.